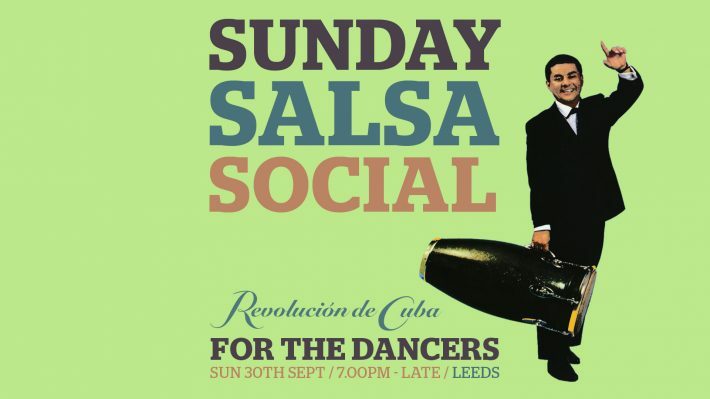 The third Sunday Salsa Social at Revolucion De Cuba Leeds is Sunday 30th September 2018. You lucky salseros are getting TWO parties in September due to 5 weekends this month. Thanks to DJ George Donoghue aka Dr Salsa for stepping in last minute on the day to cover for DJ Fabio Bahia who couldn’t make it down due to an incident Sunday morning which resulted in him suffering a broken tooth and bruising. He’s okay now, fixed up and ready to DJ for you at Calle Ocho Leeds this Saturday night at The Faversham. George smashed it and played some great salsa music. We’ll have to get him back in the future. For the third party, us two resident DJs Lubi and Fabio Bahia are back for another laid back Sunday social….nice and chilled vibe, good music and dancing and nice food and cocktails at great prices (2-for-1 deals all night on both). Once again, same timings of 7pm-12 midnight. Same DJs – Lubi and Fabio. Same price – just £3. Same music policy – just good music that includes past and present salsa, some mambo and Cuban vibes and a bit of bachata and cha cha. If we hit 100+ dancers again, the venue are happy to book another two parties for October and November and look at once a month Sunday Salsa Social parties every month for 2019.